Who wouldn’t want to own a home in South Carolina? It’s one of the most beautiful and artistic states in the nation – plus, how about that coastline? And owning a home provides a sense of ownership and security that you just can’t get from an apartment – that uniquely American freedom of owning a place that you can truly call your own and being able to modify, repair, add to, and maintain the property however you like. But if you have bad credit, home ownership in South Carolina can feel like an impossibility. It’s frustrating to have your mortgage application get rejected again and again. 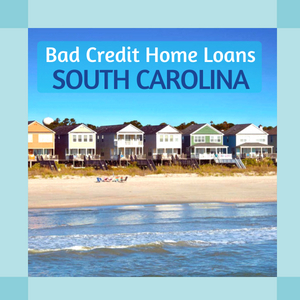 But rather than give up hope, why not read this comprehensive guide to finding bad credit home loans in South Carolina.? 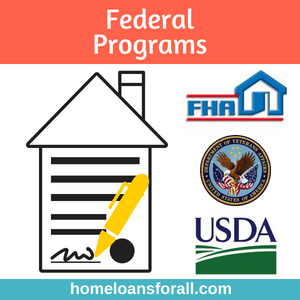 We’ll go through the federal programs you can apply for like the VA and FHA loans, the SC Housing Homebuyer Programs, and alternatives like co-signers and rent-to-own contracts. Why is credit so important in the first place? Well, your FICO credit score is a measure of your payment history and credit utilization. The better you are at paying off your bills and existing debt, the higher your score is. That’s why mortgage lenders in South Carolina are so often looking for high credit scores – they want to be sure that they’re going to get their money back. Of course, you and I know that sometimes bad credit happens to good people, but that’s no concern of theirs. There’s another important factor that mortgage lenders in South Carolina consider when they’re deciding whether to approve or reject a loan application: the applicant’s debt-to-income ratio. This number is a comparison of the amount of debt you have accumulated in student loans, auto loans, and any pre-existing mortgages to your current gross income. This is important because you are more likely to make your payments if your income is high enough to cover all of your debts (with plenty left over for groceries, entertainment, and those random expenses that crop up in life.) Most lenders want your debt-to-income ratio to be 40 percent or less. If you’re looking for a mortgage loan for bad credit in South Carolina, you should start by looking at the state and federal level government programs that can help you find a bad credit home loan or receive other home buyer assistance. Loans for people with bad credit in South Carolina usually make up for the lower credit requirements with some other inconvenience – the most common of which is a higher down payment that must be paid up front. For this reason, down payment assistance can often be very helpful when you’re looking for an SC bad credit home loan. The SC Housing Homebuyer Program is a type of South Carolina bad credit home loan that comes with low, fixed interest rates and up to $6,000 of down payment assistance. This means that the South Carolina Housing Agency will pay up to $6,000 of the down payment on your house via a second deferred loan that you won’t have to pay back until after the 30 year loan has been paid. Note that this program is not available in all counties (see details here) and that it is only available to those with a credit score of 620 or lower. Looking for teacher-specific home assistance? Click here! 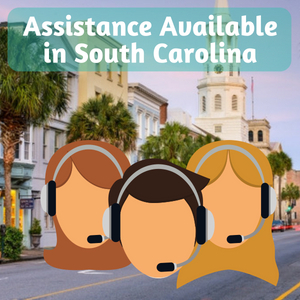 If you are ineligible for or uninterested in the SC Housing Homebuyer Program, there are a number of federal programs that you can take advantage of in order to secure mortgage loans for bad credit in South Carolina. FHA loans are the most popular type of mortgage in the country, offered by most private lenders and banks. As the name suggests, these loans are insured by the Federal Housing Administration, a branch of the American government which promises to pay back these private lenders if you have to default on your mortgage. Because of this insurance, lenders feel that FHA loans are a safer investment than other bad credit home loans in South Carolina and will offer much more lenient terms on these mortgages, including no minimum credit requirements and lower down payments. VA loans are available to current and former members of the armed services and like the FHA loans they have no minimum credit requirements. These bad credit home loans in South Carolina can also save you thousands of dollars in private mortgage insurance payments and in the initial down payment by waiving both entirely. 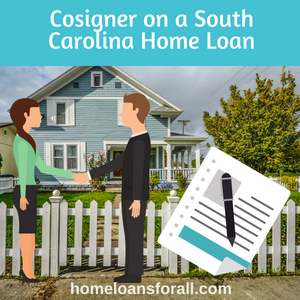 This is the perfect choice if you are a South Carolina service member with bad credit and you want to secure a home loan that might otherwise not be available to you. Loans given out by the US Department of Agriculture are available to anyone living in a rural area of the state of South Carolina and will frequently have better terms overall than other forms of conventional home loan. These USDA mortgages are typically for individuals with higher credit scores, but they can be underwritten manually by the lender to make them into bad credit home loans in South Carolina. If you can’t get or don’t want one of the bad credit mortgages that are available through state and federal programs, you might need to find a trusted friend or family member to cosign the loan with you. The benefit of a cosigner is that you can apply for the loan with their credit score instead of theirs and secure more favorable terms. The downside is that the cosigner then assumes a certain amount of responsibility for the loan and will be expected to make payments on the mortgage if you cannot. This option is often popular with recent graduates and other South Carolina home buyers with bad credit who, for one reason or another, haven’t had time to build up a credit score and want to find a place to live as soon as possible. Another option that sidesteps the whole issue of bad credit home loans in South Carolina is finding a rent to own contract. This option usually costs more in the long run but can help you find a place to live in the short term if you have major credit damage to repair. A rent to own contract is a standard rental contract (including the much lower or even non-existent credit requirements of such a contract) with one major difference: a potential options fee, paid up front like a down payment on a bad credit mortgage. Once you’ve paid this fee, a portion of your monthly rent payments will be put towards the principal of the home. After the lease is up, you will have the chance to buy the house outright. This will require you to find loans for people with bad credit in South Carolina. If you’re a first time buyer looking for an SC bad credit mortgage, your best bet is probably the FHA loan option. These loans have no minimum credit requirement AND no down payment, which means that you don’t have to have taken the time to save up and hand over a big wad of cash up front. A first time SC home buyer with a 580 credit score or higher will only need a 3.5 percent down payment (as opposed to the 20 percent down payment required by most conventional mortgages). If you have a lower credit score, you may have to pay a down payment as high as 10 percent or provide alternative forms of credit such as proof that you have consistently paid your electric, water, and/or credit card bills. Few things cause more damage to a credit score than foreclosing on a house or filing for bankruptcy. In most cases you will have to wait seven years between filing for bankruptcy in South Carolina and applying for a new mortgage. However, South Carolina FHA loans and South Carolina VA loans have much shorter waiting periods – three years and two years, respectively. So if you’ve just filed for bankruptcy in SC, now’s a good time to start building your credit and looking around for a bad credit home loan. If you’re looking for home buyer help, there’s plenty available in the state of South Carolina. The federal government’s Department of Housing and Urban Development (the infamous HUD) approves special counseling agencies that can answer any questions you have about the home buying process, while the South Carolina Housing Agency holds seminars and can be contacted online for state- or county-specific assistance. The homestead tax credit is a very useful tool for making a potential South Carolina property more affordable for those with or without bad credit. This exemption limits the amount that a property you are currently paying off can be taxed during increases each year. In South Carolina, the Homestead Exemption can be a complete exemption of taxes on the first $50,000. Credit repair is tough, even with the expert assistance we and others can provide. But there’s two things everyone in South Carolina can do to make their credit score a little better. The first is to start paying your bills regularly – this has a huge effect on your FICO score when done consistently. And the second is to start paying off your existing debts (student loans, pre-existing mortgages, car payments, etc. ), which improves both your credit score AND your debt-to-income ratio. Make sure to keep an eye on your credit with regular soft pull credit checks. The great state of South Carolina is a beautiful place to live and work, and we hope you’ll be able to join us here soon as a home owner. Having poor credit can make the already complicated home buying process feel even more impossible, but we know that with the help of these SC bad credit home loans you’ll be able to find a home of your own in no time!